Makai Ocean Engineering, Inc. made multiple new sales of its popular software for route engineering, installation planning, and real-time lay control of subsea cables. 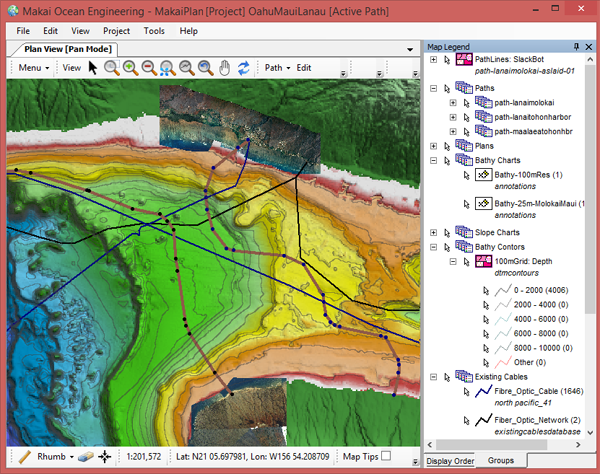 A screenshot of MakaiPlan being used for a cable route engineering study, showing a cable route near Maui, Hawaii. … And multiple MakaiPlan licenses were purchased by other consultants. Unlike other GIS software, Makai provides our clients with a comprehensive set of software tools and training that span the entire cable project, from inception to installation. MakaiPlan is the world’s #1 cable route planning and engineering software, with over 300 licenses sold over the last 14 years. MakaiPlan Pro is powerful and precise 3D, dynamic simulation software used to identify installation risks and prepare a detailed installation plan before ever going to sea. MakaiLay is advanced subsea cable installation software that enables users to lay submarine cables with the highest level of accuracy, speed, safety, and reliability possible today, dramatically reducing the risk of cable failures. The software has been rigorously tested and validated, and has been used by over 75% of the global fleet of cable ships on countless commercial lays and military installations to successfully install well over 500,000 km of cable worldwide.